Many great homes in America show how the rich lived during the years when industry giants could amass huge fortunes from steel, coal or cotton. One of the most accessible homes is the country home of the du Pont family, known as Winterthur. Here you will find astonishing gardens to view, a gracious mansion filled with American-crafted decorative arts, and even an “Enchanted Forrest” to delight your grandchildren. Winterthur is in the area known as the Brandywine Valley, which is about an hour southeast of Philadelphia, or about two hours north of Washington, DC. 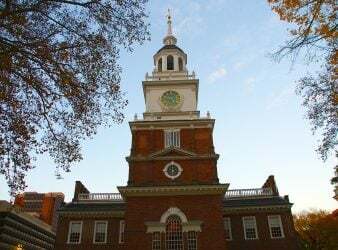 The area can be an easy day trip from most major cities on the I-95 corridor. However, there are so many museums, gardens and art galleries in this area that you might want to spend several days there. (See Details below for more information). Originally an unassuming vacation home of the wealthy industrialist Henry du Pont, the home gradually became the showcase of his expansive collection of early American furniture and art. As he added more rooms and acquired more land, du Pont built a railroad link to bring the family there from Philadelphia. This allowed the family to move there full-time just before World War I. In 1930 du Pont decided to leave the home to the public as a museum, along with his vast collections. The size of the mansion will astonish you—there are over 175 rooms! Du Pont’s collections of brass, silver, copper, and porcelain items, as well as carved furniture from early Americana, fill the rooms. The dining room is set for a banquet, with gleaming silver, candles and bouquets of flowers. Elegance brought to life with an elegant curving staircase up to the bedroom level. While the family lived in the upper floors, some of the lower floors look like stage sets showing how Americans lived in different eras. You can take a stroll down Shop Lane, a brick street flanked by storefronts of the 18th and 19th centuries. Go “window shopping” among the displays of English ceramics, gleaming silver, and lustrous copper cook wares. You can also visit the China Shop, filled with rare Chinese porcelains. More window shopping is available at the End Shop, where shelves laden with bolts of cloth and utilitarian wares recall a general dry goods store from the 1800s. 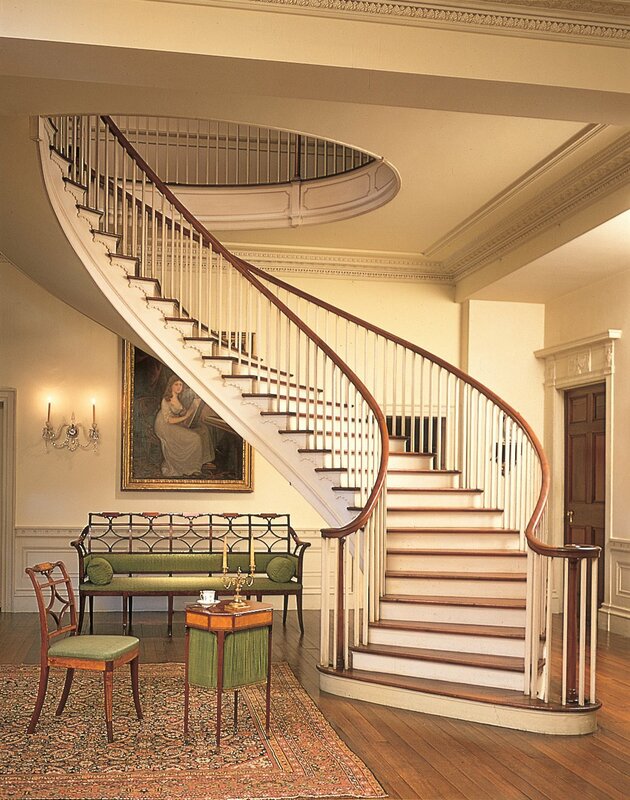 Since you can’t tour the entire house in one day, Winterthur offers both one-hour and two-hour “discovery tours” where you can see some of the highlights of the collection. If you have time consider also taking a specialty tour (which can change with the seasons). Special tour offerings this spring include the family-friendly “Time Traveler’s Tour”. This tour focuses on the areas of the house where the family lived. 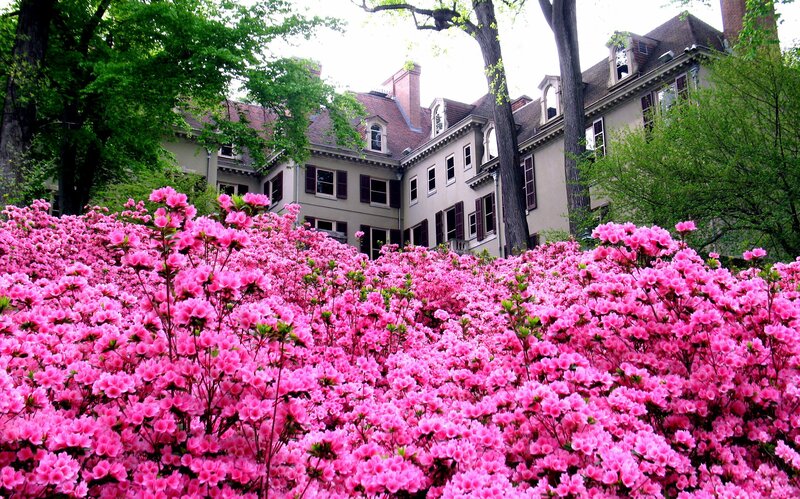 Another tour, the “Spring Tour” (running March 1-July 2), will show you how the du Pont family entertained in the mansion. One of the most elegant rooms, the Chinese Parlor, features bright yellow and red hand-painted wall paper. The paper is complimented by large vases of blooms from the gardens. Card parties in this room hosted the financial and political titans of the day. Whichever tours entice you be sure to save several hours to tour the gardens. Hop inside the open air garden tram to tour the gardens in comfort. You can ride the full loop, or get off for short walks among the trees. The Winterthur website features a webcam of the gardens. Use the webcam to check ahead to find the optimum blooming period whatever time of year you visit. 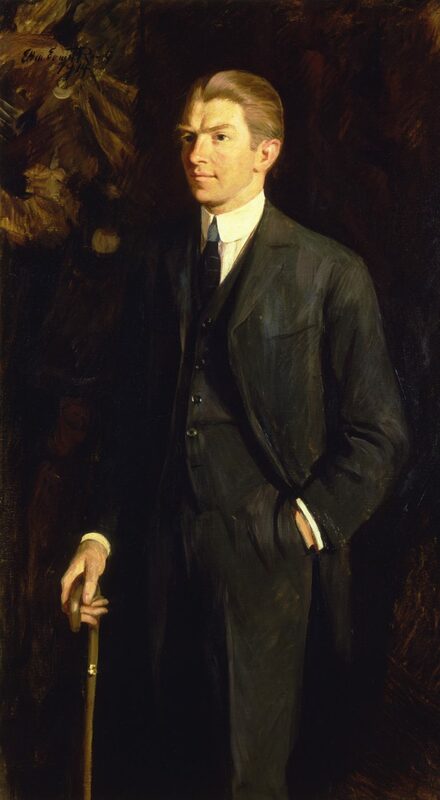 Winterthur became the life-long love of du Pont’s only son, Henry Francis after World War II. Although he was Harvard-educated, his interests lie in practical agriculture and gardening. So he used the 2,500 acres of the home to create a Utopian world full of rolling meadows and woodlands, known as “naturalistic gardens.” Open year round, the gardens share delights even in the winter months. 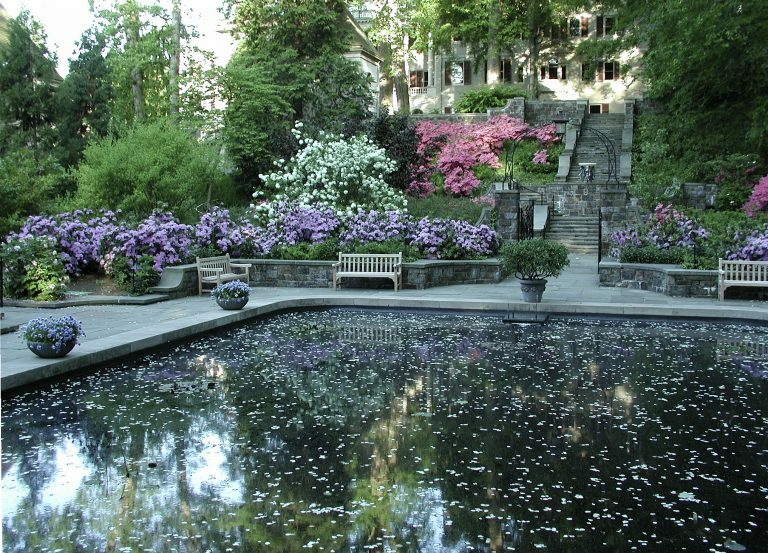 A visit to Winterthur in the spring showcases the beauty of the “March Bank”. The canvas of bright-colored blooms changes colors with the seasons. Take time to rest on a bench under a shade tree to watch the wind move across the hills. Catch the whiff of the blooms, scattered in a palette of yellow, blue and red. Then listen to the silent symphony as they swirl and sway in the breeze. But the real treat is to bring your grandchildren to enjoy the “gardens of the fairies” known as the Enchanted Wood. Children can enter a fairie cottage and tiptoe over the troll’s bridge. In addition, children find “magic” stones which release a fairie mist when stepped on. Even if you don’t bring children to enjoy the Woods, you will delight in watching little girls, many wearing glitter fairy wings, have a make-believe tea in the gardens. You are even encouraged to bring a picnic to share among the hobbit cottages! 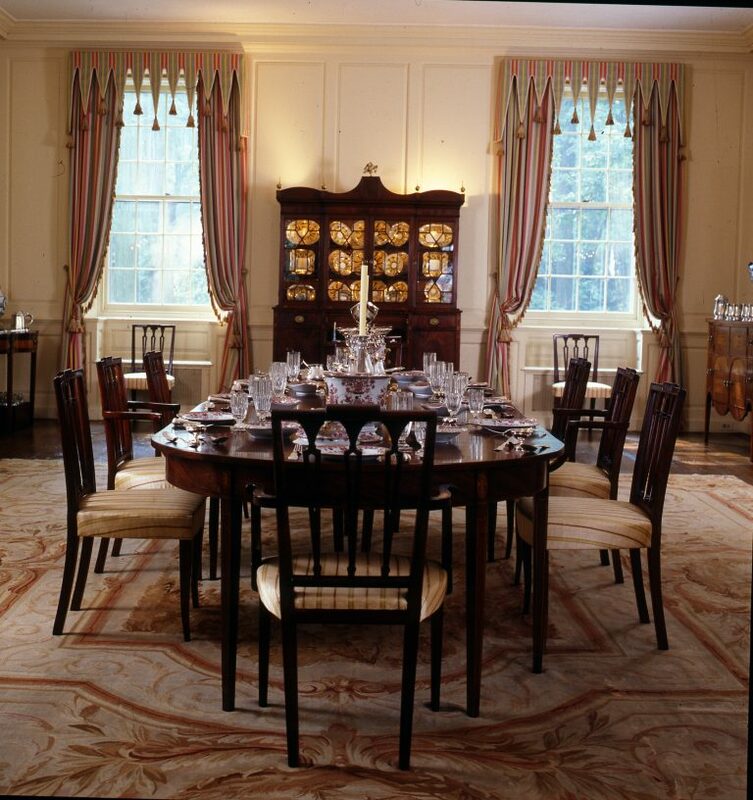 Winterthur is open at 10:00 a.m. but the last tour of the house leaves at 3:15. The garden trams will be very full in the afternoon. In addition, the grounds close at 5:00 p.m. so plan your day carefully! See winterthur.org for full information on tours, disabled access, and special exhibits. Winterthur, part of the newly unveiled Delaware History Trail, highlights sites which impacted both Delaware’s history and the nation’s history. Go to visitDelaware.com for details, and to download the Trail Passport. As you visit each site, use your smart phone to record the visit. After you visit 18 sites on the trail, you can turn in your passport for a free copy of the limited-edition book, Landmarks and Legacies. There are many historical Bed and Breakfast accommodations in the area that offer specials. Go to bvbb.com for links and more information. Enjoy a stay at a former stop on the Underground Railroad by staying at 1732 Folke Stone Bed and Breakfast, only minutes from many of the Brandywine Valley attractions. If you have time to visit another Garden in the area, the Longwood Gardens are nearby. Go to longwoodgardens.com for more information. Read more articles in this series and other posts by Marcy Gouge on MilesGeek.